With Multy, poor wireless connectivity at home is a thing of the past. A single Multy provides a powerful wireless network throughout all rooms of your home covering up to 232 m². 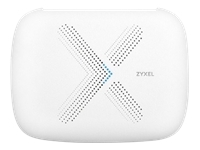 Setup is a breeze, and Tri-Band technology provides full-strength Wi-Fi without degradation. Single sign-in enables convenient room-to-room roaming, and, because it is compatible with Alexa, Multy can even be controlled using voice commands. Vi är tillgängliga för alla frågor och önskemål.